Was Adopting an Inbound Approach a Mistake? Inbound marketing has been greeted with tremendous excitement. It’s hard to believe but just five years ago, few people had even heard of it, and today more than 84% of companies are implementing at least some portion of the inbound marketing methodology. It’s no surprise that inbound has been adopted so quickly. When exposed to the proposition, it just makes so much sense. I remember when I took my first steps into inbound. I was sure lead generation was going to be a breeze and the opportunity to bring hard measurements meant I was finally going to be able to demonstrate the impact of marketing. While the excitement around inbound is still high, it’s also suffering from a bit of fatigue as many people have found that it’s not quite the panacea many hoped it would be. The truth is that inbound marketing is really hard. There are a lot of moving parts and keeping it all together is a huge challenge. As for results, many are seeing improvements in lead generation but revenue isn’t moving in the right direction. In some cases, company leaders are starting to apply pressure on marketing to deliver. They may be running out of patience. After all, the promise of inbound marketing left us all with big expectations. If you find yourself in a position where you are doubting your decision or are at a loss in explaining the lackluster results you’re experiencing, it’s time to take a step back. 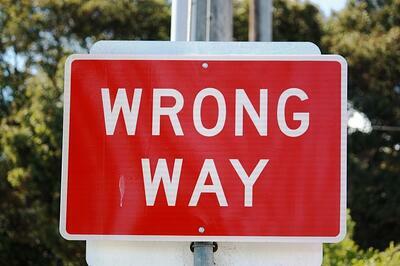 Your decision to implement an inbound marketing approach, in all likelihood, was not a mistake. But you could be making some mistakes that aren’t helping your cause. When you started your inbound journey, there were a few must-dos before you could even get started. Number one was developing your buyer personas. From there, you probably created an editorial calendar for your blog and premium content. Email marketing, lead nurturing, social media and campaigns came next and are all probably part of your plan. As I mentioned earlier, there are a lot of moving parts and if they are not all working together, you’re probably not seeing the results you had hoped for. At Imagine, we recently took a deeper dive into our buyer personas. It actually started last year when we mapped out the buyer’s journey for each persona and identified specific actions they take along the way. Since then, we have spent significant time figuring out what questions they are asking at every phase of their buyer’s journey – we’re actually still working on it. This process has not been easy but the information we are putting together will help us build a clear strategy for each of our personas that includes all of the moving parts. Everything from blog posts to your website to lead nurturing campaigns must be working together to move your prospects from one part of the journey to the next. Not having a clear strategy in place opens the door to chaos for you and your prospects. When I first discovered inbound marketing, I was convinced that moving forward, it was the only way to go. As a traditional marketer, I hated the idea of telemarketing, cold calling, inside sales…anything that related to calling. I believed that no one wants to be bothered with a call – EVER – end of story. I was so excited about the prospect of eliminating that tactic from marketing and sales forever. Enter Imagine Business Development. As I explained in my post about what I learned in my first year, inbound marketing is not the “Field of Dreams” marketing approach I believed it to be. Simply building the pieces does not translate to revenue. Your prospects do not show up just because you built an inbound marketing machine. Over the last year, I have learned that the outbound efforts I had been exposed to throughout my career were poor at best. They failed and felt intrusive because they were not designed properly. When done right, they are extremely effective. Inbound advocates have realized this too. The conversation has recently turned to “inbound selling.” Expect to see a lot of information about the topic in the coming months. Read this post for Doug’s take on this movement. At the end of the day, if your inbound approach does not include an outbound effort and is not delivering the results you need, it’s time to reconsider. Inbound alone cannot impact the bottom line like a multi-pronged approach can. Sales and marketing alignment is a key element of inbound marketing success. Without it and a clearly defined service level agreement (SLA), your efforts can only have limited success. If your inbound efforts are working, then you are generating leads but have you clearly laid out what happens next? The key to turning those leads into paying customers is to manage them effectively. Part one of your SLA should include lead definitions. Specific definitions for qualified leads, marketing qualified leads and sales qualified leads should be spelled out so there are no questions. In conjunction with the definitions should be defined goals. Work backwards from your revenue goals to determine the number of each type of lead you need to reach those goals. From there determine when and how handoffs occur. When an inbound lead comes in, where does it go? Depending on the structure of your team, define what happens to each type of lead. Also determine how each lead is managed. For example, how many emails and calls do they receive over what time frame. Metrics also need to be identified, agreed upon and reviewed on a regular basis. For more information on creating an SLA, download our workbook. Marketing automation platforms, like HubSpot, are a critical part of inbound marketing. Without one, all of the moving parts are nearly impossible to manage and track. However, if you are relying on your selected platform to do it all for you, you’re making a mistake. HubSpot and the other options are simply tools. When used correctly, they can make your job easier and provide valuable information to guide your efforts. They CANNOT know and understand your buyer personas, write relevant, contextual content or attract an audience of followers on social media. That all takes significant human effort. Marketing automation enables you to create, distribute and measure what you are doing – but you still have to figure out what you need to do to turn your prospects into customers. Simply implementing marketing automation does not guarantee success. Inbound marketing is hard work but can be very effective when done well. If you’re not getting the results you need or expected, do not throw in the towel. Adjusting your approach and expectations may be all it takes to start moving the needle in the right direction.